So thrilled to see Alysia and Jayson's names pop up on the consult form as the couples photographer. They NEVER disappoint! And Lisa and Ryan's wedding at the BMI not only looked like an absolute blast, but also stunning. One of our most popular designs in the collection. Love to highlight this amazing city with different iconic landmarks! These cold winter days has us dreaming of summer weddings, and days when it doesn't get dark until 8pm. A few pics from the archives! Catching up a bit on some of the lovely work and brides we have had the privilege to work with lately. Some oldies and some more recent work in the studio. Enjoy! Sharing today Halley and Adam's wedding invitations from their gorgeous wedding at The George Peabody Library from this past November. 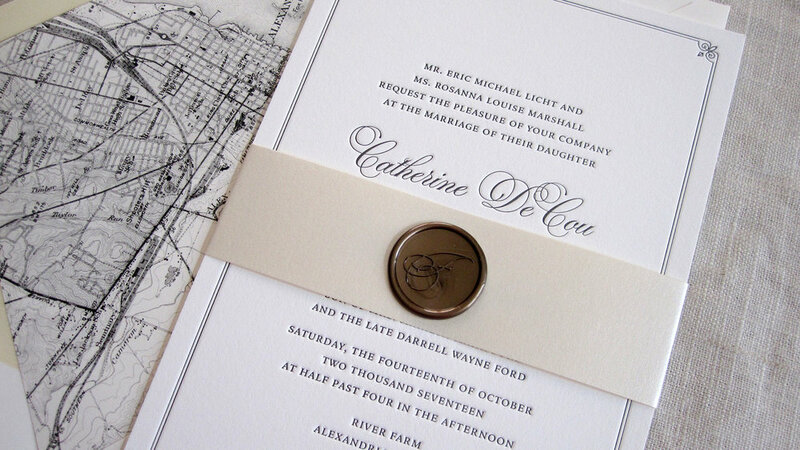 I love a bride who is not afraid of adding in black to her wedding invitations. The black envelope liner and black edge painting on her letterpressed invitations added a sense of modern to her overall classic invitations. The blush belly band and rsvp envelopes really complimented and balanced the modern details. Loved every detail of this bride and wedding! Absolutely blown away by Lisa and Jon's stunning wedding this August at the Evergreen Museum and Library. This venue has always been one of my top favorites and their wedding did not disappoint at all. Lisa's vision of vintage/Gatsby meet glam/modern was pulled off beautifully by Elle Ellinghaus Designs. Every detail was flawless. I especially love the gorgeous gold foil on black menus we designed for the reception! Enjoy these gorgeous images from Treehouse Photography. Absolutely LOVE a good Charm City Wedding and Caroline & Ryan's did not disappoint. So elegant with just a few touches of whisky thanks to the talented ladies of Lemon and Lime Event Design. Enjoy these gorgeous photos from their wedding Fells Point courtesy of Brooke Tyson Photography! What to say about these two. The first time I spoke with Katherine, she mentioned she wanted Halloween Horror Movie table numbers. I was a bit hesitant at first because for starters, I DO NOT do scary movies, and two, was wondering how they were going to pull this off. They knocked it out of the park. Katherine and Jeff were one of my favorite couples and down right hysterical). Any couple who is in agreement to put Freddy Kreuger on their table numbers is a match made in heaven. Their wedding day was perfect and truly about them as a couple. Once I knew Elle from EED was behind this beautiful wedding, I knew it would be jaw-droopingly stunning. Enjoy these photos from Dani Leigh Photography! Seriously...how cute is this couple! Rachel was one of my favorites and I loved seeing an email pop up from her in my inbox. She had such a way with words that every single email left me cracking up with laughter. I knew her wedding would be full of those personal and memorable touches that are always stunning. As always, the gorgeous work of Jennifer McMenamin and the picture perfect George Peabody Library left all those details beautifully captured. Congratulations Rachel and Ben! Nabely and Mike's wedding so beautifully captured by Artful Weddings is filled with amazing details. From the venue (one of my favorites), the traditional sweet moments of a church ceremony, to Nabely's gorgeous gown. We absolutely loved working with these two....a couple truly head over heels with each other. So excited to be sharing these stunning photos from Liz and Jordan's big day this past August at Pier 5. Being a city resident, I always love the true city weddings complete with the gorgeous backdrops of Baltimore. Their stunning wedding was captured so beautifully by Jennifer McMenamin Photography.